I am a sucker for familiar stories told from an outsider’s point of view. A good example is the very familiar story of The Odyssey… as told by all the women Odysseus uhhhhh, encountered, on his long weird trip home. (To put it mildly, he was a player. )It’s a safe bet most of them weren’t exactly happy with the experience. The coolest thing about doing these interviews is meeting (at least virtually) people with the most interesting backgrounds. Such is the case with Tamara. So what’s the Tamara Agha-Jaffar story? I was born in Baghdad, Iraq. My parents moved to England when I was very young so I have little recollection of my country of birth. I was raised in England and then attended university in Lebanon where I obtained my Bachelor’s and Master’s degrees in English Literature. I obtained my Ph.D. in English Literature from Washington State. My husband and I have lived in the U.S. for the last 40 years. We have two sons and two grandchildren. I have been in academia all my professional life. I was a Professor of English for about 18 years. I introduced several new courses to the college curriculum, including Introduction to Women’s Studies, Women in Literature, and Women in Religion. I moved to the “dark side” of academia when I became an administrator. I was Dean of Humanities and Fine Arts for a few years and then the Vice President for Academic Affairs for several years before my retirement in July 2013. The Carnegie Foundation honored me in 2004 by naming me Kansas Professor of the Year, and I received President Barack Obama’s Call to Service Award in 2010 for my volunteer work in the local shelter for battered women and in the school district. I have been fascinated by mythology and ancient cultures for a number of years and have decided that when I grow up, I want to become an anthropologist and archaeologist rolled into one. I would love to get dirt under my fingernails by unearthing ancient artifacts and structures and learning more about the cultures that gave birth to them. It tells the story of Odysseus’ return from Troy through the voices of the women involved in his escapades. I thought it was time we heard the voices of women. 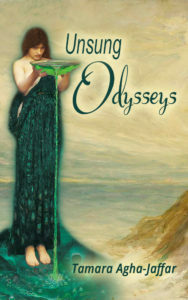 Each female speaks directly to the reader in her own voice, describing her encounter with and feelings toward Odysseus. The speakers are Anticleia, Penelope, Circe, Athena, Calypso, Nausicaa, and Eurycleia. The narrative progresses with each character picking up the thread where the previous character left off. Although these are mythological characters, they interact with each other on a human level and are easily relatable. Their gendered perspective is reflected in their dialogue and reaction to events. That’s a cool take. What inspired your approach? It’s the sort of situation where one thing naturally progressed into another. My immersion in mythology and women’s role in ancient myths gave birth to my first book, Demeter and Persephone: Lessons from a Myth (McFarland 2002), a feminist interpretation of the classical Greek myth based on Homer’s Hymn to Demeter. I followed this with my second book, Women and Goddesses in Myth and Sacred Text: An Anthology (Pearson 2005), a cross-cultural text for women in world religions and indigenous cultures. 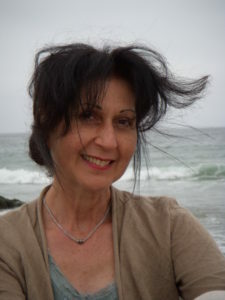 When I finally had time to breathe after my retirement, I went back to the Demeter/Persephone myth and wrote my first novel, A Pomegranate and the Maiden. This is a re-telling of the myth through the voices of the characters involved in the story. My love of the mythology and culture of the ancient world, especially the mythology of Mesopotamia, Sumer, Egypt, Classical Greece, and Rome continues unabated. I love to give voice to characters in myths, to put myself inside their skin and hear them express themselves. I believe ancient myths still have so much to say to us and write a blog on my website in which I interpret myths by teasing out their nuggets of wisdom. My love of Homer also continues unabated. I have read both the Iliad and the Odyssey more times than I can recall. Of the two, I prefer the Odyssey because it doesn’t have quite so much blood and gore and because it gives greater prominence to women. So it was a natural progression for me to go from writing a novel based on Homer’s Hymn to Demeter to one based on his Odyssey. Much of the analysis and discussion of the Odyssey focuses on the character of Odysseus and his adventures, so I thought it would be interesting to hear the voices of women since they could provide a gendered perspective on events absent from the original. I tried to get inside the skin of each woman, breathing life into her and articulating her thoughts and reactions. I had fun doing it. I hope my readers will enjoy reading it as much as I enjoyed writing it. I have a lot of “favorite” scenes in the novel, but if I had to pick one, it would be the scene where Calypso confronts Hermes when he informs her of Zeus’ command to release Odysseus from captivity. Calypso flips out. She yells, hisses, screeches, and throws things at Hermes in her anger. She lashes out at him and all the male gods, launching into a venomous tirade about gender discrimination and the patriarchal bastion that is the Greek pantheon. I had a lot of fun writing that scene.